WASHINGTON — In commemoration of the 35th anniversary of the Reagan administration’s seminal report, “A Nation at Risk,” a bipartisan group of policymakers and education and business leaders gathered at the Reagan Institute Summit on Education (RISE) to discuss the challenges and progress across the American education landscape since 1983. With an emphasis on then-President Ronald Reagan’s message that it is the responsibility of all citizens to restore excellence in America’s schools, RISE highlighted focal areas for educators and officials at the federal, state and local levels to increase access to quality education, lifelong learning experiences and other opportunities that create pathways to fulfilling careers for students. Romy Drucker (left) with panelists Condoleezza Rice and Janet Napolitano. Frederick J. Ryan Jr., chairman of the Board of Trustees of the Ronald Reagan Presidential Foundation and Institute, said education is the institute’s first focus. He said the institute will examine five major objectives the initial “A Nation at Risk” report focused on: leadership, improving teaching, improving educational content, raising standards and expectations and adding time to the school day. A primary concern for education leaders today is that a zip code can determine whether a student receives a quality education, said Dr. Condoleezza Rice, former U.S. Secretary of State and former provost of Stanford University. In the opening plenary, “The Learning Society,” she warned that the United States could become two societies: one that is competent and another that is not. “A democracy really cannot thrive and survive” without quality education,” Rice said, adding that education is “the new frontier” in the civil rights struggle. University of California president Janet Napolitano echoed Rice’s sentiment. She said a collective investment and a “joint interest” in quality education for all students “is a value for the country” and will help each individual reach the full measure of their talents, be socially engaged and enter fulfilling careers. 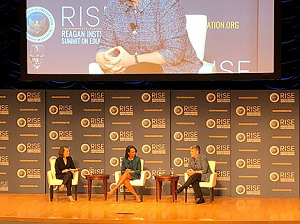 Both Rice and Napolitano urged leaders to set high expectations for students throughout their academic endeavors, and to reduce the cost of higher education. Money for public education should be at the top of the federal government’s funding list, Napolitano said. Addressing other topics ranging from immigration and gun safety to political polarization caused by social media, the two panelists said a bipartisan effort to find “common sense” solutions will be necessary. Throughout the summit, education leaders and policymakers examined the progress made in education over the last 35 years and discussed current challenges facing the educational system. Dr. Milt Goldberg, former executive director of the National Commission on Excellence in Education — the commission that published “A Nation at Risk” — was blunt. Saying that education should be a national priority and a state responsibility, panelists offered different perspectives on the degree of responsibility local school systems should have in teaching and preparing students – particularly students who may need additional support. Teachers and how they are prepared are a “critical element” of a student’s overall learning experience, said Peggy Brookins, president and chief executive officer of the National Board of Professional Teaching Standards (NBPTS). Due to an education system that has struggled in recent years to produce people who have the skills to fill the nearly six million currently available jobs in the country, businesses and industries are now seeking collaborations with education systems, said Rep. Dr. Virginia Foxx, R-N.C.
Patricia Levesque, chief executive officer of the Foundation for Excellence in Education, said educators at the K-12 and post-secondary levels should work to ensure that students have access to programs that offer college credit and industry certificates. A session on the “new basics” of education for the next generation of Americans underscored a growing focus for educators today: using technology to prepare students for the jobs of tomorrow. Educators also should be teaching students “digital citizenship,” said Richard Culatta, chief executive of International Society of Technology in Education. Such instruction would enable students to consider how they can use technology as a means to improve their community and the world, he said. On higher education leaders’ roles for preparing students for the future workforce, American Council on Education president Dr. Ted Mitchell said institutional leaders must move beyond the purview of a system that largely focuses on the residential, traditional students age18 to 24. An obligation to meet the unique needs of adult learners as well as first-generation students is critical, several speakers said. U.S. Secretary of Education Betsy DeVos added that “we need to take down the silos” that have separated four-year institutions and career and technical education. She cited dual-enrollment opportunities, apprenticeships and other CTE endeavors as ways to provide students with nontraditional pathways to a career and lifelong learning. Former secretaries of education Arne Duncan, John B. King Jr., Rod Paige and Margaret Spellings closed the summit, offering predictions for education in America and the work to still be done. Some expressed concerns about lack of urgency on education reform and a failure to identify clear educational goals within the current presidential administration. “We’ve failed to make education an issue that anyone votes about,” Duncan said. Spellings called for people to think about “what it is that will unite us” on the education front for all learners in America. She suggested reinvigorating a coalition between the business and civil rights communities to make progress on education reform. Paige encouraged the media to play a role in bringing education’s challenges and successes to the forefront of the nation’s consciousness. Dr. Jill Biden, wife of former Vice President Joe Biden, issued a reminder about the purpose of education.